The follow-up to the sensational 2005 debut From Your Grave, The Absence return on Riders Of The Plague with a solid sophomore effort. 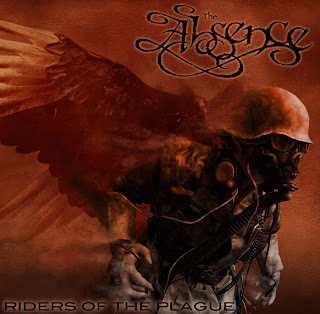 Continuing the development of the band's aggressive melodic death sound shaded with modern thrash elements, Riders Of The Plague contains some pearls, but generally delivers robust consistency rather than sparkling brilliance. With the band now reduced to a foursome after the departure of bassist Nicholas Calaci, there is a slight loss of sharpness, particularly in the middle part of the album. The Absence appear to settle for proficiency, without pushing often enough towards sharp edges. The album does launch with plenty of power. Opener and title track Riders Of The Plague starts with a crashing bang and hellish scream from Jamie Stewart, and proceeds to nurture a playful riff to the mountain of metal. The second track Dead And Gone is the best original composition on the album, a confident earth mover rearranging the landscape in favour of an irrepressible melody. The Murder boasts an acoustic intro that is quickly drawn and quartered by a drum-heavy assault setting up an oriental tune promising much harm. The other two notable tracks arrive late on the album. The longest track Merciless gets another slow acoustic intro before dropping into haunted Luigi's Mansion territory for a dance with the ghosts conjured up by metal. But by far the most impressive song on Riders Of The Plague is the cover of Testament's Into The Pit. The Absence take the original by the scruff of the neck, feed it an unhealthy dose of steroids, and let it loose. The result is an eruption of muscled melodic death thrash lasting 2:48 but leaving behind a monstrous conglomeration of carnage. Riders Of The Plague does not rewrite melodic death metal history, but does add a sturdy chapter. Produced, Engineered, Mixed and Mastered by Jonas Kjellgren. All Ace Black Blog Heave Metal CD Reviews are here.